Here’s a look at what we are eating this week. 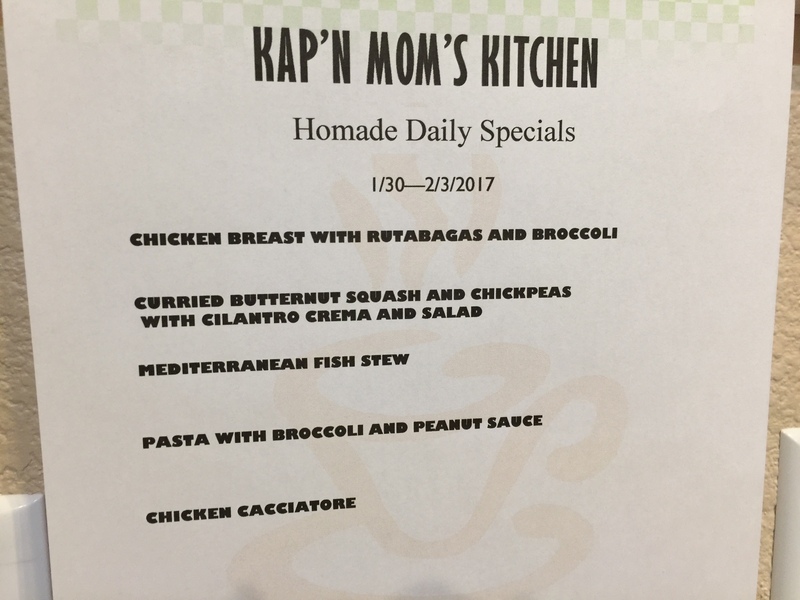 You’ll see that Kap’n Mom has been pretty close to the original plan. 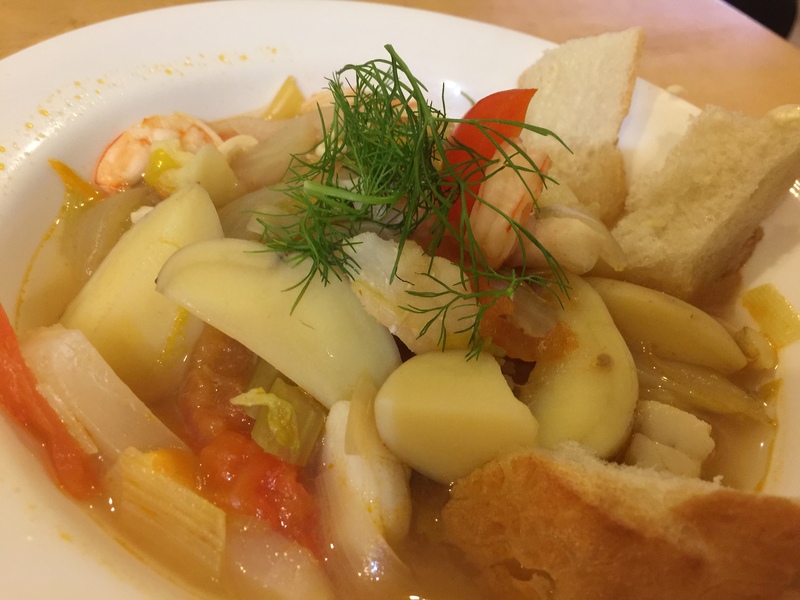 Only thing different is that we switched around the Pasta with Peanut Sauce and the Mediterranean Fish Stew because John was working on Wednesday and he likes to be involved when we make the fish stew. 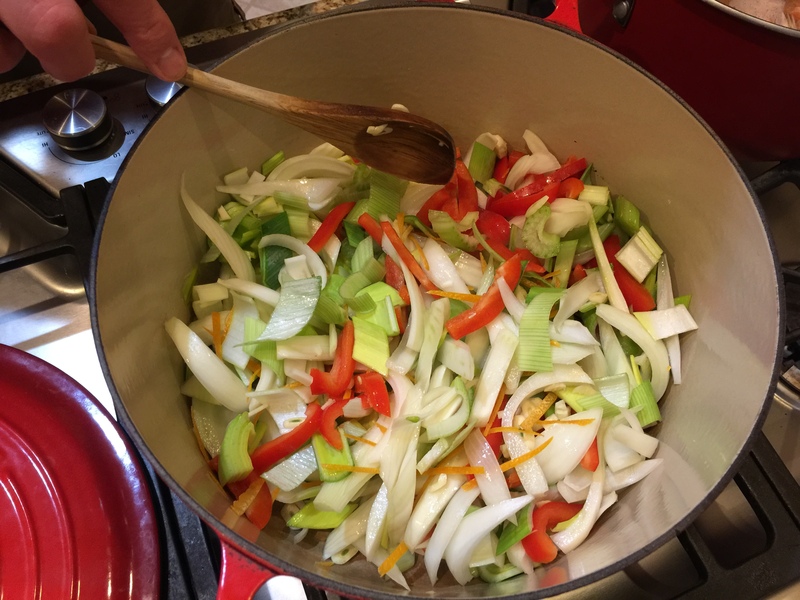 I like this recipe because it involves a lot of chopping up and also because it is low in calories. I had to chop up onions, fennel, leeks, bell pepper, potatoes, tomatoes, garlic, orange zest, and celery. They are all supposed to be about the same size (except for the garlic and orange zest) so that made the chopping more interesting. John sautéed the vegetables first in a little olive oil. John also made a shrimp stock out of the leftover shrimp shells that we keep adding to in the freezer until we have enough to make stock. The shrimp stock was the basis of the dish. In our freezer we had Pacific cod, shrimp, and scallops so that is the seafood we used for this. Rick Stein’s recipe calls for all sorts of seafood like red mullet and baby octopi but we are fine with just using what we have. After the potatoes are cooked through (new potatoes cut in fourths) it is time to put the seafood in. It cooks in no time and it’s time to eat! 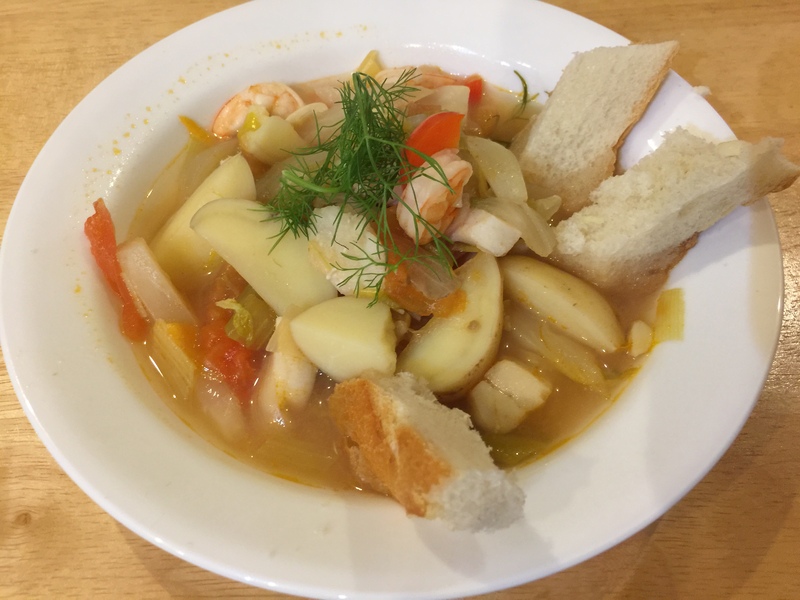 This entry was posted in Fish, pescatarian, Shellfish, Uncategorized, Vegetables and tagged bell pepper, Celery, fennel, garlic, leeks, new potatoes, Onions, Pacific cod, Pernod, scallops, shrimp, shrimp stock, tomatoes. Bookmark the permalink.